The world’s biggest consumer technology trade show, CES 2019, ended its four-day run in Las Vegas on Friday with attendees coming away talking about 5G wireless, 8K television, artificial intelligence and other hot tech areas for the year ahead and beyond. Chipmakers Intel (INTC) and Qualcomm (QCOM) dueled over 5G chips, while wireless carriers Verizon (VZ) and AT&T (T) touted their plans for fifth-generation cellular networks. 5G networks are set to go live in some metropolitan areas this year. They will offer blazing-fast download speeds and low-latency data links for smartphones and other devices. TV makers like LG Electronics and Samsung wowed attendees with giant-screen 8K televisions. The new TVs offer twice the resolution of today’s 4K sets for supercrisp pictures. But content will be scarce for some time. LG also showed off a rollable-screen television. The LG Signature OLED R television has a 65-inch screen that retracts into a compact cabinet. The cabinet doubles as a high-end stereo speaker. Meanwhile, Alphabet‘s (GOOGL) Google Assistant and Amazon (AMZN) Alexa blanketed the show, with the voice assistants providing their computer smarts to everything from bathroom mirrors to kitchen appliances. 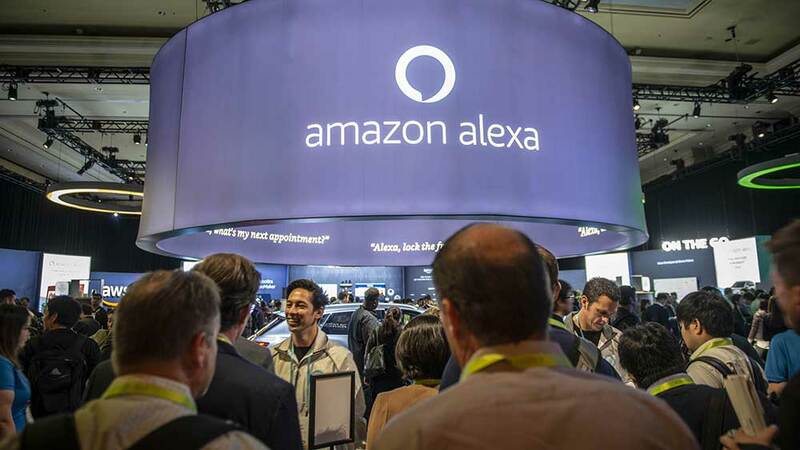 Amazon Alexa and Google Assistant both had large exhibit spaces at CES and were featured prominently in third-party booths promoting their use of the technologies. Google set up a fun house in the plaza outside the Las Vegas Convention Center to show off all the gadgets that use its AI helper. The building even featured a Disney-esque musical ride called the Google Assistant Ride. Amazon Alexa caused a stir during Qualcomm’s media briefing when it interrupted a speaker by saying, “No, that’s not true.” A Qualcomm representative was giving a live demo on how Alexa works with automobiles when Alexa gave her unsolicited commentary. Amazon boasted having more than 150 products with Alexa built into them, from headphones and PCs, to cars and smart home devices. At the show, it announced the latest devices getting Alexa voice technology, including Vuzix (VUZI) smartglasses and Sony (SNE) noise-canceling wireless headphones. Other tech areas turning heads at CES 2019 included self-driving vehicles, augmented reality glasses, robots and smart home devices. Electric scooters and bikes proliferated on the show floor. Personal computer maker Dell Technologies (DELL) and graphics-chip makers AMD (AMD) and Nvidia (NVDA) showed off their latest high-end gear for PC gamers. Streaming video platform Roku (ROKU) announced on the eve of CES that its active accounts topped 27 million in the fourth quarter. But Amazon took the wind out of its sails by revealing Wednesday that its Fire TV platform has “well over” 30 million active users. This year’s show attracted some unusual first-time exhibitors: agricultural equipment giant Deere (DE), consumer products firm Procter & Gamble (PG) and plant-based meat innovator Impossible Foods. Tech-gadget website Engadget named the Impossible Burger 2.0 from Impossible Foods as its “Best of the Best” in its Best of CES 2019 Awards. Impossible Foods expected to serve at least 12,000 free samples of the Impossible Burger 2.0 during CES 2019. It dished out the product from a food truck parked outside the convention center. Document Security Systems, Inc. (DSS) Stock: Is This Tech Stock Worth Your Investment?